Now in its 15th year, the Chefs in Shorts event brings together a group of the area’s top culinary talent who will fire up the grills and create their favorite dishes during this expansive outdoor, summer-in-the-city barbeque hosted at the Seaport Hotel & World Trade Center. 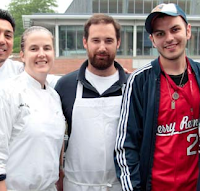 Join some of Boston’s best chefs for an evening of grill-offs, desserts, beer, wine and fun all to benefit Future Chefs, a local non-profit school-to-career program focused in culinary arts. 0 Response to "15th Annual Chefs in Shorts - 6/22"